Cross Plains Motors, Inc. has been providing complete truck and auto repair to Cross Plains area residents and businesses since 1971. Our ASE-certified technicians will always get the job done right and get you back on the road as soon as possible. Towing services are also available. Bring your car in for anything from an oil change or tune up to tire, brakes, engine or exhaust repair. We have been providing area businesses with Fleet Repair and Maintenance services for both light pickup trucks up to diesel truck repair and 18-wheelers for over 45 years. We are both trusted and dependable! Stop in an see our inventory of pre-owned vehicles and pick yourself a REAL DEAL! Cross Plains Motors also provides towing service, so whether you need to be towed from your home or work place, or anywhere else within 100 miles, give us a call for fast reliable service. Page Summary: Looking for "auto repair near me"? Call Cross Plains Motors for local auto repair, car service, oil changes and other car and truck repairs in Madison WI, Cross Plains and Middleton. 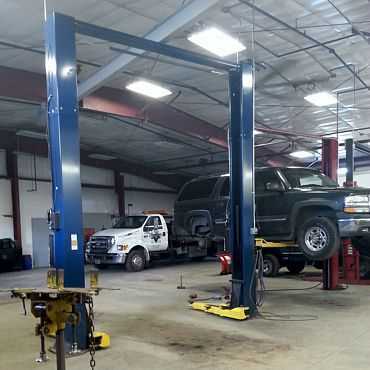 Our certified ASE auto and truck repair mechanics offer everything from exhaust, transmission and brake repair to tire, engine, air conditioning and diesel repair for Mount Horeb, Black Earth and Mazomanie, as well as Lodi, Sauk City, Verona, Waunakee and surrounding Dane County Wisconsin communities.